On the final day of my week-long stay at newly-opened Planet Hollywood Costa Rica, it’s time to get a spa afternoon in before leaving the lush, tropical breezes and warmth on my skin. 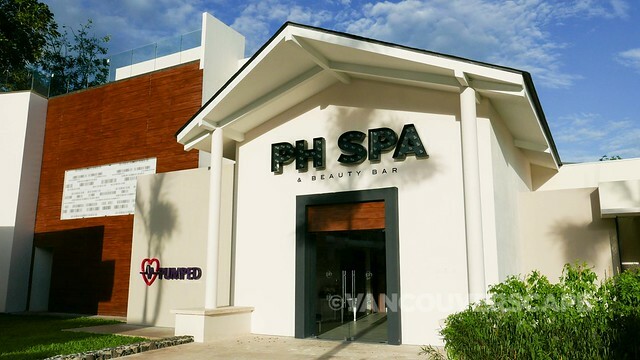 Located right next to PUMPED Fitness Center and close to the main pool, PH Spa is a full-service facility offering everything from massages to bridal makeup and facials. 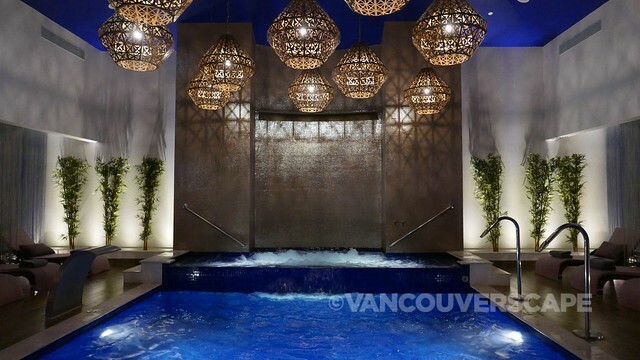 As a Star Class guest, I’m offered a 45-minute hydrotherapy session here. Once checked in at the beautiful lobby (that chandelier! ), I’m led to the changing rooms and shower area. 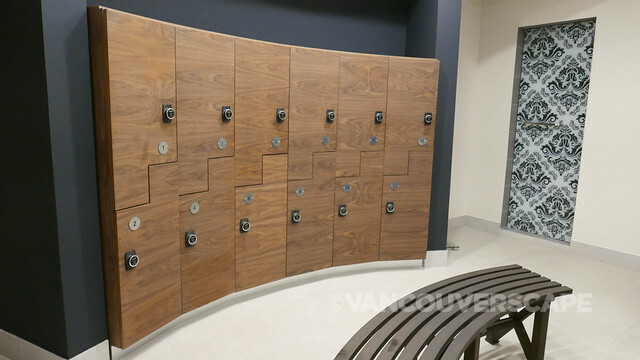 The lockers have such a clean, modern aesthetic as they interlock into one another Tetris-style. My handy RFID Planet Hollywood wristband works to open and close the lockers here, so I won’t need any keys. As I enter the hydrotherapy room, an attendant points out a special violet light from above that helps “balance the body and reduce blood pressure”. There’s both cold water bucket and ‘emotional’ (top-to-bottom rows of mist jets) showers near the main hydrotherapy pool. But before I indulge in the pools, sauna and steam room, it’s time for a massage! The spa contains seven treatment rooms with eight massage therapists on board. Massages are movie-themed as well: Glitz, Glamour and Glow, a 90-minute massage, is part of the Hollywood Golden Age package series. Other massages include the Private Screening, The New Release, Surround Sound, Featurette, Sunset Blvd and Feature Length. My massage therapist Jeymi leads me to a quiet, dimly-lit treatment room and soon begins to work her magic hands across my body. The Feature Length is a classic full-body Swedish massage with individual style and choice of pressure (in my case, medium, por favor). By the time my 50 minutes are up, I’m even more sad to be saying farewell to this lovely spa, but what a way to wind down a week in Caribbean paradise! And then I get spoiled some more. After my massage and hydrotherapy sessions, I select a perfectly-ripe kiwi from the fruit bowl and an attendant slices it onto a little dish for me, followed by an even lovelier small oval-shaped white porcelain dish with four small, similarly shaped Costa Rican 85% dark chocolate pieces to slowly savour alongside a refreshing glass of orange-infused water. Sitting near the splashy series of fountains provides a sense of calm on a beautiful afternoon, far from that inevitable evening flight home to chilly days and nights. And once I do manage to tear myself away from this soothing oasis? Strawberry margarita-making class? Pool Zumba? A turn on the calm water with an SUP, peddle board or aqua bike? The choices are seemingly endless for a newly-established resort that I’m sure will become a highly-visited one as the mercury continues to drop. Pura Vida! My Feature Length massage was compliments of Planet Hollywood. Opinions, as always, remain my own. Non-watermarked images courtesy of Planet Hollywood Hotels.